Preached at Trinity Baptist Church on April 8, 2012. Bible scholars are unclear as to the real ending of the Gospel of Mark. If you look in your Bibles later this evening to catch up on some Easter reading, you’ll note that there are several “endings” to Mark 16. We are not sure whether it ends at verse 8 or verse 9 or verse 19, or whether there are other lines included. The whole thing is a mess really. We do know that the earliest manuscripts only have up to verse 8. We assume that later editions included a longer ending because who would want to have women running in fear to conclude a gospel? That is not a good ending; we need to know what happened to the disciples, what Jesus said to them once he appeared to them in Galilee. But, then again, I kind of like the abrupt ending in Mark 16:8. 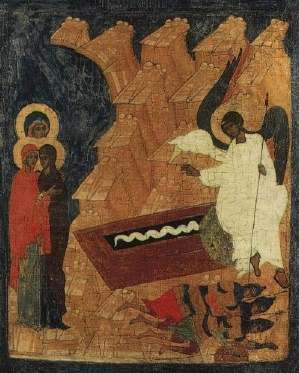 The women run from the tomb in fear. I can relate to that: Who wouldn’t be scared of seeing a ghost in a graveyard in the wee hours of the morning? And where were the disciples? They weren’t there when Jesus needed him most. They, too, should have been there. Perhaps they were like the women, only too scared to come before the fact. Too afraid to be caught there, or too afraid that Jesus might actually do what he said he would do: rise on the third day. And who would want to answer to Jesus if he confronted them at the tomb? All of them–save one disciple according to John’s gospel–abandoned him. They would be afraid and too embarrassed to say anything to Jesus at all! I met a guy at Trinity years ago. My wife and I took time to get to know him and his fiance. They started to attend the church regularly, and we were excited to have some new friends. But, one night he called me: He and his fiance were having issues. They fought…a lot. His job was failing; the recession was in full force by then and he wasn’t getting work projects like he used to. Between finances and bickering, it seemed that the couple was on thin ice. Within a month, they dropped out of church. It was getting difficult for Kris and I to reach them. Phone lines were disconnected, the couple split and moved in separate homes. They didn’t call to update our contact list. It struck me as odd that when this family was at its most vulnerable, most broken, they alienated themselves and fell away from church. Church is fun to attend, and it’s a place to celebrate God’s love and mercy and good friends and good times. But shouldn’t it also be the first place to which someone attends when they are down-and-out, when they have run out of money to tithe and to tip, when their sins are so stacked against them that they can barely find their way out of the avalanche of darkness? They weren’t the only ones I know of who have walked away from a church community in the time of greatest need. I guess it gets too embarrassing to have to come into a place full of people and have to answer the question, “How are you?” differently than you did before. That’s more than embarrassing, that’s fearful. I guess all of us are afraid now and then to show who we really are, especially at church. By now many of you know stories about my parents; my dad in particular. You know that he has a sense of humor. So it won’t surprise you to also know that when I was an adolescent, there were times when I made a new friend and I tried my hardest to not to bring that friend home to meet him. Like other teenagers that age, I was embarrassed of my parents, embarrassed that my father would say something silly as he usually does. Eventually, however, all of my friends at one time or another would have to meet my parents—that’s just the type of people we are. But something odd always happened—whenever my friends spent time with Mom and Dad, my friends really liked them. No one ever thought my Dad was a dork, and people actually really genuinely liked spending time with them when they came over to hang out. I guess I was just afraid to show people who I really was, who my parents were. And the embarrassment didn’t stop there. When I was ordained, my family and I went out to eat. All my dad wanted to do was to introduce me as “Reverend Joe LaGuardia.” I don’t know, maybe he thought it would get us a better table or faster service or something. I was embarrassed to tell people I was a minister: When I did, I could always see people change before my eyes. Their body language shifted; some people cleaned up their language or smiled a crooked smile or made small talk before quickly moving on to the next crowd. At that time, I was lucky to tell people that I was a teacher. That is, until they asked me where I taught and I said a Christian school. Same change. Whenever I told someone I was a minister, I wasn’t sure if I was more embarrassed of myself for having the title of clergy or for them for being embarrassed by my presence. No matter; I think all of us have something to fear when we are in the presence of divinity. By the way—where were the disciples on Easter morning? You know, Peter, so boldly identified that Jesus was the Messiah. Or James and John, the sons of thunder, who argued with the other disciples about who was going to sit on the left and right sides of Jesus once Jesus came into all his splendor. Where are those guys? In the darkest hour and in their most vulnerable time, shouldn’t the empty tomb be the first place they went to when they needed God the most rather than the first place from which to run? I guess if I was Peter and denied Christ three times or the others, who were unaccounted at Jesus’ trial and crucifixion, I too would be too embarrassed to go back to church to talk to Jesus. Either that, or they would probably get really polite and become masters of small talk. The disciples might shift uncomfortably in their seats; their crooked smiles hiding the brokenness that they feel inside. Peter would ask about the weather and the latest sports statistics. But it would end there, because at the end of the day, all of them—and us included—get embarrassed sometimes. We are all afraid a time or two to let others know what we are really about, especially at our darkest hour. I admit, there are even some mornings where Kristina and I would rather sleep in on a Sunday than dress up and be in community and feign a smile with other people who probably feel the same exhaustion as we. It is those moments, however, that we need to come back to the empty grave–to church and into the presence of the Risen Christ because when Jesus died on the cross, he did more than crucify those things that enslave us, he put to death pretense as well. Barbara Brown Taylor tells a moving story about one of the fondest moments she had at church. She tells of a person named Andy who lost his front cap—his tooth–in the middle of the night. She asked if he was up to reading scripture that morning, but he insisted on still reading it. He got up front, and read the text as best he could even if some of the letters caused him to whistle. At that point, writes Taylor, she recognizes that faith was more than just trying one’s best at pretense. It’s about becoming fully human in the midst of a community that recognized that we all have something to be embarrassed about, that we all have something to fear. Makes you think of Doubting Thomas, right. Remember him? When Jesus finally revealed himself to the disciples after his resurrection–the very first day of church in history, in fact!–Jesus found the disciples in a room shut off from the outside. They were speechless, most of them, and they didn’t know what to say. Yep, they were scared. I imagine that their faces were red, and more than one wanted to give an excuse as to why he didn’t go to the empty tomb with the women last Sunday morning. But it was Thomas—Doubting Thomas—someone not even sure of his own faith—who was brave enough the next time they met for church to show Jesus his true humanity. In asking Jesus to prove himself, to show the wounds in the side and the nail imprints in his hands and feet, Thomas overcame pretense and found that Jesus had some things to show for too. Come to mention it, Jesus didn’t come to church that day in a suit or a fancy bow tie, nor did he clean up for the occasion or try to make an appointment to visit with Pilate or the Sanhedrin to rub his resurrection in their faces. No, Jesus showed up with blood stains and wounds; the imprints of the thorny crown were still on his head, and his hair was probably disheveled from graveyard bed-head. And there, when Thomas felt Jesus’ side and touched the dried blood upon Jesus’ chest, they both realized that the death of Jesus was the death of all embarrassment and fear and pretense. Thomas could doubt openly, and Jesus could show off his war wounds in the light of day. I’m glad Thomas and Jesus went to church that day. I’m glad Thomas came even though his questions were too hard for the other disciples to answer. I’m glad Jesus showed up even though he didn’t wash up before church, even though his disciples were too embarrassed to come meet him at the empty tomb. I’m glad that Mark originally ended his chapter at verse 8 with a bunch of scared women. It shows me that I can be scared sometimes and still have a calling from God to preach a Gospel I’m still not totally sure of. I’m glad that we’re Easter people: People so redeemed by God’s grace and so liberated by his love, that none of us, even those of us who are most broken and vulnerable, need to be too ashamed to meet here at the empty tomb once again. I’m glad for what Jesus did on the cross, so that even a sinner such as I can stand before you as one who is fragile and broken, made whole and fully human only because I recognize that Jesus meets me right where I am. I seriously doubt that Mark or any of his contemporaries ever intended to present the story of Jesus without including accounts of his post-resurrection appearances to the disciples. Peter repeatedly states in Acts that “We are witnesses” to His resurrection, and it is upon Peter’s remembrances that Mark based his Gospel-account. It is true that in the two earliest manuscripts of Mark 16, the text ends at 16:8. But in one of those manuscripts (Vaticanus), the copyist placed a prolonged blank space after that, as if he recollected the absent verses from a different exemplar, and attempted to leave space for them in case the eventual owner of the manuscript wanted to include them. In the other one (Sinaiticus), the page on which the ending of Mark is written was not produced by the same copyist who made the surrounding pages; Mark 15:54b-Luke 1:56a is on four replacement-pages, consisting of one parchment sheet (folded in the middle, church-bulletin-style), and the copyist who made the replacement-pages had to consciously stretch his lettering to avoid having the same blank-column feature that is in Vaticanus appear in Sinaiticus. Those two manuscripts from the 300’s (both of which were almost certainly produced at Caesarea) are exceptional. All the other undamaged Greek copies of Mark 16 – -over 1,500 copies — include verses 9-20. And I don’t just mean medieval copies. I mean other ancient manuscripts, such as Codex Alexandrinus and Codex Bezae and Codex Ephremi Rescriptus and Codex W.
Plus, Vaticanus and Sinaiticus are *not* the earliest evidence where the ending of the Gospel of Mark is concerned. In the 100’s, Justin Martyr used verbiage from Mark 16:20 in “First Apology” chapter 45 (and probably from 16:14 in chapter 50, too), c. 160; Tatian included the passage in his Diatessaron, c. 172; the anonymous author of “Epistula Apostolorum” seems to be aware of its narrative framework, and Irenaeus, c. 184, specifically quotes 16:19 and states that it is from the Gospel of Mark. Irenaues (who visited Rome in the 170’s) must have been using a copy of Mark at least 145 years older than Codex Vaticanus. We have four second-century writers supporting the inclusion of Mark 16:9-20. 99.9% of the Greek manuscripts include the passage (even the six that also have the “Shorter Ending”). Plus, Mark 16:9-20 occupies a prominent place in the ancient lectionary-cycle (as a reading for Ascension-Day and as the third Heothinon), and is supported by over 40 patristic writers from the era of the Roman Empire (including not only the ones I’ve already mentioned, but also diverse writers such as Ambrose, Augustine, Pelagius, Jerome, and even Hierocles). The internal evidence — particularly the non-transition between 16:8 and 16:9 — may favor the idea that we’re looking at a part of the text that was not added by the main human author of the Gospel of Mark. That alone, though, is not justification to consider these verses uninspired or uncanonical. We routinely acknowledge as Scripture many parts of books that were not added by those books’ main human author (such as Jeremiah 52, or Proverbs 30 and 31, or many of the Psalms). It looks to me like Mark was interrupted by some sudden emergency (which could easily happen in Rome in the mid-60’s), and a short, already-written freestanding summary of Christ’s post-resurrection appearances was added to complete the narrative, and then, /after the text was thus completed/, copies began to be made for church-use.